High Cup Nick, walks in the northern dales starting at Appleby Station. Ana Cross on the North York Moors, subject of coach walks catering for all grades of walkers. This page gives the latest news that may affect any of our activities - such as additional events, website updates, changes to our published programme, or problems with the trains we are using. 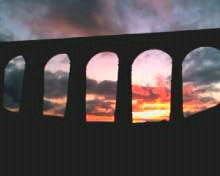 The easy Wharfedale line walk from the Strid to Addingham via Dales Way and Bolton Abbey will now be from the 0933 Leeds to Ilkley train. Please send any items for inclusion in the next members' newsletter (Spring 2019) to the editor, Jane Coupe, as soon as possible, but no later than 19 April 2019. A selection of photos from the recent members' weekend in Ennerdale, Cumbria can be accessed in the Past Events (Holidays 2019) section. Please see the Members Events section for details of the amended joining instructions for these walks which begin on 25 April 2019. Following suspension of the strike action at Northern Rail, our train walks will now continue as per the programme printed in our "Free Guided Walks" leaflet, January to June 2019 edition. Our January newsletter has now been published and copies distributed to members by post and email. Full details and booking information for the Weymouth holiday from 29 June to 5 July 2019 are included with the newsletter. The pick up points (times might be changed but not earlier) will be Leeds, Aire Street 8.30 am and Bradford Interchange at 9.15 am. If you wish to book for this holiday and have not yet received your newsletter then you can send an email to alan.kemmenoe@gmail.com requesting a booking form. Please state whether you intend to send the deposit by cheque through the post or bank transfer. Our forthcoming walks programme from January to June 2019 can now been viewed in the Train Walks section. During any further rail strikes or future engineering works, every effort will be made to provide substitute walks - please check this website for more up to date information should this occur. Some of the details for the walks in July, August and September 2019 have now been changed from the list which was issued with the October members newsletter. Please see the Members Events section of this website for the updated details. In addition to the three "main" holidays the Youth Hostel weekend (2 nights) will be held at YHA Ravenstor, near Monsal Head, Derbyshire on 13 to 15 September 2019. Please see the Holidays section for more information and the booking form will be issued with a future edition of the members newsletter. Details of our 2019 programme of Thursday Walks and Lake District Walks have now been added in the Members section. The latest members' newsletter has now been produced and distributed by post and email. Please send any items for the next edition (New Year 2019) to the new editor, Jane Coupe, as soon as possible - her contact details can be found in the current newsletter.